Here's a great idea, and a new blog for you to try out. 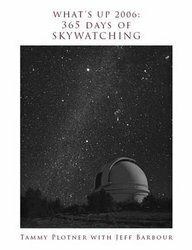 A while ago we pointed out that you could download a free book covering what's happening in the night sky every night for a year. The book is provided via the excellent Universe Today news blog. However, it's a hefty download, and would take a lot of printing (400+ pages) so maybe you'd like to access it more conveniently ? Well the book is now available as a daily blog at http://www.astrowhatsup.com/. There are ideas for what to look at each night of the year, as well as interesting facts / space history and photos. A lot of work has gone into preparing this book/blog and it's well worth checking out, and there's even an option to integrate it with our own website, which I'll be looking at over the next week or so.